As a Washington basement and crawl space repair expert, we treat our customers’ satisfaction and our product quality with the utmost importance. We don’t just provide a service and then cut off ties with our customers. Rainy Day Basement Systems offers our customers a service program making our service technicians, available Monday through Friday, from 8 a.m. to 5 p.m. (depending on service and location). Our service technician visits with the scheduled customer, reviews the condition of any/all pumps and parts -- all the while checking the basins and cleaning out any buildup or sediment. 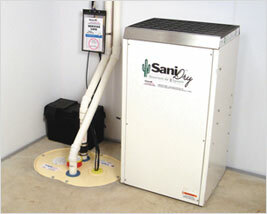 If you have a SaniDry™ dehumidifier, he will also perform any routine maintenance needed on the unit, such as changing filters. We pride ourselves on our customer service—we’re here to help you! We aspire to always be prepared and reliable to show you why we’re the contractor you can trust! When you call Rainy Day Basement Systems for service, you’re not asking just anyone to evaluate the condition of your home’s crawl space or basement—you're asking certified experts in the field who can answer all your questions in complete honesty. Simply put, we want what’s best for you and your home. Our service technician will arrive at your home as fully prepared as possible, with anything he might need to provide you with the best possible service. If by any chance there’s something needed that he doesn’t have readily available, he can easily order the part and have it ready for use. He’ll make note of everything he finds and fill out a maintenance record—one copy will be given to you to keep, and one given to the office to file. We’re so thankful to have been able to work with you and make your home a healthier and more comfortable place to live in. Rainy Day Basement Systems wants to reassure you that we believe in our products and repairs, and we want to remain in contact with you. This service program is how we'll keep your crawlspace or basement in top shape, and protect your home from any new problems, if there are any. We will check all parts and keep you informed of any upgrades that are suggested, and why. We want you to have the best protection possible for your home, so you can enjoy it the way it was meant to be enjoyed! We believe Basement Systems, Inc. products are of the highest quality. We never suggest a repair as part of a scheme, while knowing that the product is insufficient. In fact, we offer a warranty on most of our products. For example, although the Zoeller pumps we install come with the manufacturer’s 1-year warranty, we offer Optional Extended Pump Warranties to either 3 or 5 years. Contact us today to request more information about warranties or to schedule your annual maintenance appointment. For all details regarding servicing fees and inclusions please contact us, we’d be happy to inform you about any additional information.